Museum Madness campers visit Clerance and enjoy a close up view of the trains. Preparations for the annual Museum Madness Children’s Discovery Program are underway and registration is open for the programing set July 9 – 13, 2018, at the Union County Heritage Museum. Class sizes are limited and ages are incoming 2nd graders to incoming 4th grade students. 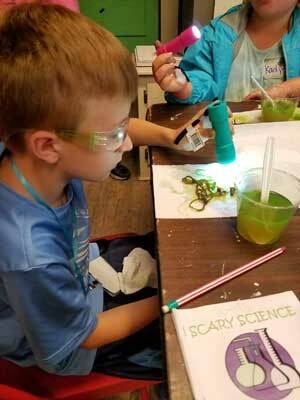 A 2017 camper with his Scary Science experiment. The program is daily from 9 a.m. until 12 noon and includes learning on a topic of the day, craft and art period, and snack. Cost is $10 for museum members per day and $15 for non members per day. For campers signing up for the entire week, a free Madness T shirt is in the deal. Travel back in time to the Medieval Era and learn about the life in that time. Discover the rich history of the family’s coat of arms. Learn as Rebecca Browning demonstrates the fantastic world of drawing and painting. Learn the basics of drawing and draw your self. 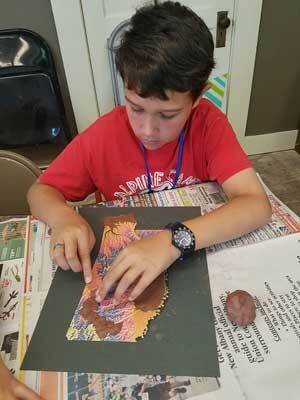 A 2017 camper, making a land form map of the state of Mississippi. Experience first aid techniques and CPR. Learn firsthand by licensed professionals. Become a detective and solve the mystery behind the priceless items that have been stolen. Solve the mystery before the thief gets away and save the day. Dress your children in play clothes. To sign up for the week come by the museum or call 662-538-0014. You can email jill@ucheritagemuseum.com for more information.